Our mission is to study cycling as it intersects with cities, people and society, to better understand how to accelerate the widespread use of the bicycle as a means of transportation. Our research and program resources leverage knowledge from the fields of urban planning, psychology, economics and sustainability to impact policy, governance and community development. Research has demonstrated that increased rates of cycling for transportation can deliver better population health outcomes, reduce greenhouse gas emissions and create vibrant and resilient communities. Our work helps to make that future a reality. Our work was initiated in 2012 upon receipt of a partnership development grant from the Social Science and Humanities Research Council (SSHRC), the Cycling Think & Do Tank combines expert practitioners and academics to address an important gap in knowledge about building more sustainable cities: how experience from the behavioural change field (applied extensively to building occupants and health promotion) can be transferred to the field of active transportation. The project goal is to encourage more people to cycle as their primary means of transportation, particularly over the short distances that make up a high proportion of daily trips. The relationship between physical infrastructure (parking, on-road lanes, separated bike express-ways etc.) and more and safer commuter cycling has long nourished a “build and they will come” approach. Although effective, even world leaders in the Netherlands and Denmark are increasingly pressed to push modal shares up over the 50% targets they have set, to meet greenhouse gas emission, health, and other crucial policy goals. This challenge is even more apparent in transitioning cities such as Toronto. Although cycling’s share of daily trips has grown, differences by ward reveal that behavioural factors are crucial if Toronto is to benefit from the economic, public health, air quality and other benefits of integrating cycling as the prime transport mode for trips of up to 7 km and for access to public transit. Initial research efforts focus on mapping cycling intensities across Toronto, identifying both demographic factors which coincide with cycling choice as well as important barriers to cycling. An intensive analysis of the existing cycling literature will draw out promising trends in cycling adoption and will present a sequence of steps with proven success, forming a basis for a new set of integrated tools for cycling promotion. Further research efforts will explore the impact of cycling on local economic development. With this initiative, Principal Investigator Beth Savan, a veteran University of Toronto School of Environment researcher and recent Director of the Sustainability Office, has built a coalition to map cycling patterns, explore economic benefits and to bring together literature from both environmental psychology and active transportation to develop an integrated suite of tools for increasing cycle use in daily transport. 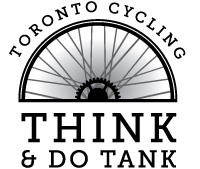 © Toronto Cycling Think & Do Tank, School of the Environment, University of Toronto 2016. The material on this site (reports, maps, charts and diagrams), created by the Toronto Cycling Think & Do Tank is licensed under a Creative Commons Attribution-NonCommercial-NoDerivs 3.0 Unported License. Our research contributions are made possible through the generous support of the Social Sciences and Humanities Research Council of Canada, The Metcalf Foundation, support from our partners and prior funding from the Heart and Stroke Foundation. Currently this research is contributing to projects and cycling programs in the Cities of Toronto, Scarborough and Ottawa, and the Regional Municipality of Peel.